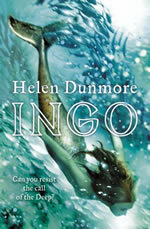 This is the first in the Ingo series by Helen Dunmore. It’s about this girl, Sapphy, and she lives with her brother, Conor and her parents near the sea, in Cornwall. Really near their house, there’s a cove, and that’s where most of the story takes place- it starts when Sapphy and Conor’s dad starts behaving strange, and finally he disappears one day, an most people think he’s left or drowned. However, Sapphy and Conor maintain the belief that their father is alive and has been taken somewhere. Soon, Conor starts behaving really weird. Sapphy notices, and she gets suspicious, so she follows Conor down to the cove one day, and she sees him. He’s talking to a girl, and in the distance she looks like she’s wearing a wetsuit that’s been pulled down to her waist. Sapphy questions him about who the girl is later, but Conor never tells. The next time Conor goes down to the cove, he says he’s only going for a bit, but he doesn’t come back, and finally when Sapphy goes to find him, he thinks its only been a few hours, not realizing its late at night now. Sapphy doesn’t know what’s going on, but when she finds out, it changes everything. This book is for younger readers- I would say, 9ish? It’s quite good, though it gets a bit cliché at times, and its very predictable.